For all it's current political problems, Zimbabwe is a red hot Bass fishing destination and home to some genuinely HUGE bass, in fact the largest Largemouth Bass caught outside of the USA and Mexico came from this country. The monster 8.2 kg (18lb 4oz) fish was caught by Maxwell Mashandure on a junebug senko on 25 July 2004 at Darwendale Dam outside Harare. Northern strain Largemouth Bass were introduced into Rhodesia in the early 1940s. These fish had been brought to South Africa in 1927 and raised at the Jonkershoek Hatchery near Cape Town. In the 1970s, the then government operated a hatchery below the famous Matopos Dam near Bulawayo. The Matopos hatchery successfully started to breed black bass for stocking and distribution. In 1982, Ray Scott, founder of BASS shipped 2500 Florida Strain Largemouth Bass fingerlings on a Delta Airlines flight then SAA via Johannesburg to Bulawayo. Only 7 fingerlings were DOA after this trip, the rest as they say is history. The descendants of these 2493 fingerlings have today made Zimbabwe a mecca for BIG Bass and perhaps even a real contender for a new World Record Largemouth Bass. 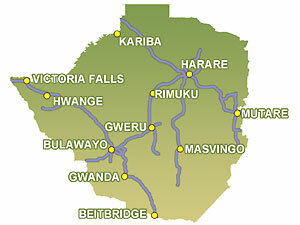 Select a lake below for a list of Bass fishing venues in Zimbabwe. Darwendale Dam outside Harare is home to some very big Bass. More info . . .
Kyle (now known as Lake Mutirikwe) is a legendary bass fishing venue near the town of Masvingo. More info . . .
Bass fishing hotspot just over the border in Zimbabwe. More info . . .